In America, one in five adults experience mental illness at least once in a given year. It is a much-researched phenomena in this country. Less-known is that the American penal system incarcerates over 2 million people with mental illnesses every year, according to the National Alliance on Mental Illness (NAMI). Mental illness isn’t a crime and shouldn’t be treated as one. When these individuals are placed into a corrections system that doesn’t give a damn about them, they suffer abuse. Prison staff are unequipped to care for them and inmates die as a result. At the Dade Correctional Institution in Florida, guards punished individuals with mental illnesses who couldn’t or wouldn’t cooperate by placing them in solitary confinement and starving them. In 2012, Dade inmate Darren Rainey, who suffered from schizophrenia, was killed because guards locked him in a scalding shower for two hours. Stories like this aren’t new. The U.S. has a messy track record of accommodating mental illness. In the 1950s, the number of people in psychiatric hospitals reached a record high, and staff administered horrifying treatments including lobotomies and electroshock therapy. After Ken Kesey published “One Flew Over the Cuckoo’s Nest” in the 1960s, public outcry against the institutions played a large part in the government shutting them down instead of attempting reform. While the intentions of the deinstitutionalization movement were commendable, execution was terrible. The number of patients in psychiatric hospitals dropped from about 500,000 in the ’50s to 70,000 in the ’90s, with the majority of them being pushed onto the street. There they were unable to receive the housing and care they required. Without aid, it was impossible for many to reintegrate into society. Instead, police detained and arrested them for disturbing the peace and drug possession. Other cases involved so-called mercy bookings, in which officers deemed a person to be safer in custody. Incarceration is not a solution. Prisons and jails are not — and never have been — equipped to house and provide care for individuals with mental illnesses. Current programs to help individuals with the rehabilitation process are ineffective. In California, a rehabilitation technique called cognitive behavioral therapy is intended to help those with mental illnesses modify their patterns of behavior to reintegrate into society. However, a state audit last year showed participants in the programs were as likely to recidivate as those who had not participated. The system in this country for treating and housing those with mental illnesses is broken. It hasn’t progressed in decades. 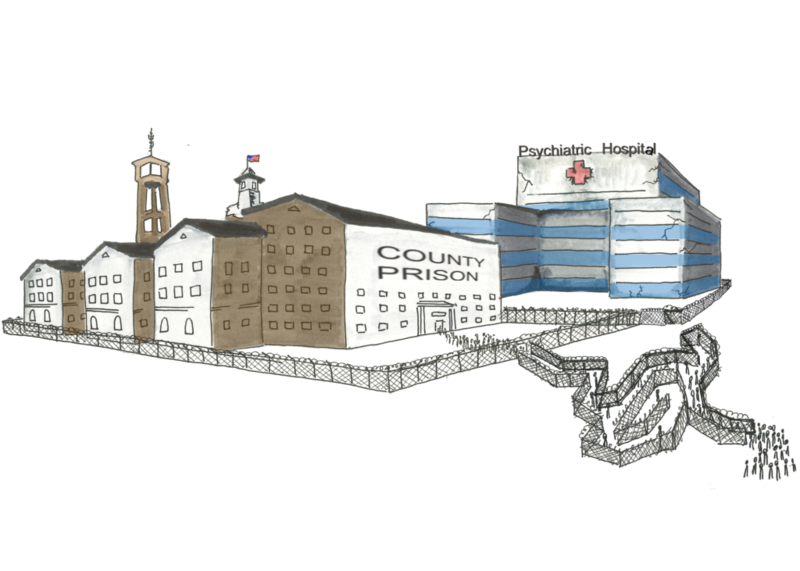 Instead, it has simply changed forms from psychiatric hospitals to prisons. We cannot continue to push responsibility from one institution to another. The government must own its mistakes and create much needed policy reform, or continue to face pushback. A lawsuit filed against Gov. Andrew Cuomo and other state officials in New York in January found that inmates with mental illnesses were being held past their release dates due to the lack of mental health facilities available. It is impossible for an individual’s mental health to improve under the conditions forced upon them in these institutions, and holding them there after they thought they’d be free to go is unacceptable. The most important thing is getting individuals who have mental illnesses or disabilities the care and attention they need. Instead, the prison system is punishing them for trying to cope in an environment that doesn’t welcome them. America needs to widen programs like assisted outpatient treatment (AOT), which is a two-way program where a court allows a patient to remain in their community if they commit to a treatment plan. Although a 2009 New York evaluation of this program showed a 44 percent decrease in harmful behavior for those in the program, AOT is not widely implemented in every state. We must also make mental health courts more prevalent. The courts serve as a justice system catered to individuals with mental illnesses with the goal of giving them a choice between seeking treatment or going to prison. To help push the country in the right direction, individuals should support organizations like the Stepping Up initiative and the Youth Justice Coalition, which change the ways mental illness and incarceration are linked in this country. Put a stop to this country’s embarrassing inability to care for those with mental illnesses.